Added on December 11, 2013 by the ikebana shop. Have you noticed in some tea bowls pale pink spots showing up at random? These spots are called "gohonte" (御本手). They appear on the pottery due to the natural reactions from the iron found in the clay when being fired in the kiln. The origin of the term "gohonte" dates back to the Azuchi-Momoyama period (late 1500's). Tea masters ordered tea bowls to be made in Korea. Together with their order, they sent samples or diagrams of what they would like made. These orders were called "gohon" or "gohonte". When the ordered pottery were delivered, most of them came with the pale pink spots due to the clay used. Soon, this type of pattern came to be called "gohonte." Originally thought of as imperfections of the glaze, gohonte came to be appreciated by tea masters. They recognized the implicit beauty in the randomness, unevenness, and naturalness of the patterns. Thus, the "flaw" was turned into another attractive aspect of the pottery! Sometimes, we have some gohonte tea bowls available at the shop. Please come and take a look! Or see available tea bowls online here. All photos by the ikebana shop. Al rights reserved. Added on December 20, 2012 by the ikebana shop. 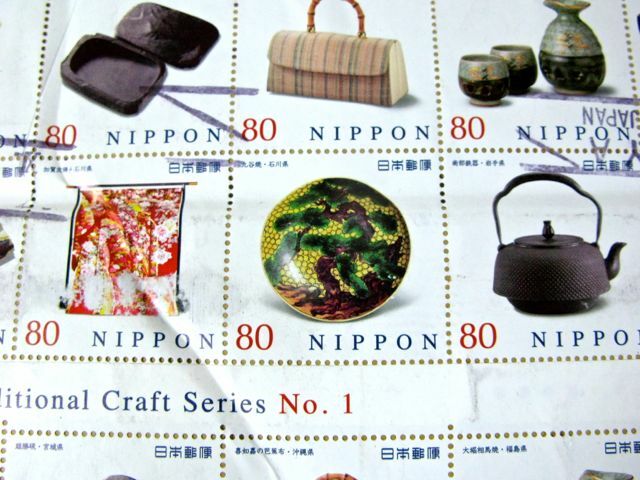 When we saw this postage stamp, we thought: "Hey, this looks familiar!" Pine, the evergreen tree, symbolizes longevity and health. The hawk, with its sharp talons and keen eyes, is quick to grasp good fortune. The Yoshidaya style of Kutani pottery makes use of only four colours: blue, yellow, green and purple. If you look closely, the brown-looking colours of the pine branches and parts of the hawk are really a tinge of purple. To see if this item is still available for purchase, click here. Added on December 6, 2012 by the ikebana shop. In old Japan, gift-giving was a ritual. A tradition of giving gifts covered with a finely embroidered square silk cloth became widespread during the Edo Period (1615-1867). This cloth is called fukusa. Formal gifts were often presented in a box with the fukusa draped over to conceal it. After being appropriately admired, the fukusa and box were returned to the giver whilst the gift was accepted. The choice of fukusa was important to reflect the formality of the occasion and the status of the gift-giver. Some fukusa have tassels so that they can be handled without touching the fabric. If you've been to the shop lately, you would have seen a pair of fukusa adorning our walls! These days, they are rarely used (except maybe during weddings) but they can be beautiful additions to your home decor! The ones we have depict cranes and pine trees--auspicious symbols of longevity and good fortune. Please drop by the shop and have a look! Added on November 21, 2012 by the ikebana shop. A friend, knowing how we love all sorts of branches, dropped these off for us. They are great for tall arrangements! Thank you, Heather! Does anybody know what they are called? Added on July 13, 2012 by the ikebana shop. In our line of work, we get asked to put up ikebana arrangements in many different places. When we do jobs at hotels and other "posh" places, most of the time it's straightforward business. This is where you need to set up. You'll find what you need there. Get the job done in time. With courtesy. Pretty much par for the course and we expect nothing more really. Sometimes, we do get treated like the hired help...like when we receive "extra" instructions like "Don't mess up the carpet. That's expensive." We take it all in stride and move on...besides, come to think of it, we are the hired help anyway. No hard feelings. So, what a delightful surprise it was to arrive at the Halifax Marriott Harbourfront and to be treated like guests! Our buckets of flowers and boxes of equipment were brought in by a porter in a shiny hotel cart, right through the front lobby! (We had been half-expecting to be asked to go through the service entrance...and of course, to haul our stuff in by ourselves.) When we reached the venue, it turned out the ballroom doors were still locked. The bellhop (who probably had nothing to do with the event planning part of the hotel business) stayed with us and made hundreds of phone calls (so we exaggerate a bit...^_^ ) until the right person with the right key came. We were in good hands! The following day, when we came back to clean up after the event, the same hospitality met us. The service was above and beyond, despite the fact that we were not there to be served! The bellhop who escorted us helped clean up the flowers and discard the leftover water from the containers. We told him that we knew this was no longer part of his job(and to the cynics out there...no, no supervisors hovering around! ^_^ )and so it was OK to leave us; but he simply replied that he wanted to help as much as he could! The spirit of omotenashi (hospitality and then some...)* is alive and and well at the Halifax Marriott Harbourfront. We salute management and staff for creating such a wonderful environment. With this one short experience, the Marriott has endeared itself to us. Guess which hotel we'll be recommending the next time we have guests from Japan? See the finished arrangement here. Added on June 23, 2012 by the ikebana shop. Any entrepreneur will tell you that setting up a new business is never easy. Back in 2008, as newcomers, we found it doubly hard to set up. Apart from not really knowing the rules of the game, we lacked that built-in network of family and friends. You know how it goes...you need to find out about something or need to get something done, you ask your elders, your cousins and your friends. Sooner or later, somebody somewhere will turn up and say, "Hey, I know this guy who can help you...." and thus, you move one more step forward towards your objective. Thankfully, for newcomers to Canada, there are the immigrant services organizations. In Nova Scotia, they are ISIS - Immigrant Settlement and Integration Services. The people there were literally our first friends in town. To any immigrant who is serious about settling and setting up shop in Nova Scotia, ISIS is a gift from heaven and we cannot thank them enough for helping us on our way. Now we have our little shop and things just keep getting better! Added on June 20, 2012 by the ikebana shop. Don't you just love it when things fall into place? A few weeks ago, a lady came to the shop looking for a Japanese doll. She said they had a beautiful one at their home when she was growing up but sadly it was no longer with her. Unfortunately, we did not have Japanese dolls in our inventory. They do tend to be very expensive and delicate...therefore, difficult to ship...which translates to very high shipping costs because of the extra special packing required to protect them. The best we could tell her was that we'd look into it and see what we could come up with but we did give advanced warning not to be shocked at the price. We do know there are some "imitation" ones out there but really, the craftsmanship would be very different...as would the price, of course; but we did not want to go down that route. As it happened, about a week later, another lady visited the shop bearing...guess what? ...a Japanese doll in her hands. She wanted to sell it and so came to ask us if we could find a buyer. We could hardly believe the timing! The doll was authentic. It was not new, of course, and there were some parts that showed the passage of time....frayed edges in some parts, some errant hair. We also saw where a little repair had been made. But still, the doll still looked grand and elegant with her drum. We immediately called the first lady and she came by to take a look. "It's even better than the one I had as a child!" she exclaimed excitedly. She didn't mind the flawed parts we pointed out and was very happy to give the doll a new home! Now, we have two happy ladies! ...which makes us happy! Added on May 27, 2012 by the ikebana shop. Many of us have probably seen them at one time or another... drawings of cute little children, dressed in Chinese style, on bowls or dishes. The children are normally depicted as playing under a pine tree, with butterflies and peonies around. These children are called "karako" (唐子), which literally translate to "Chinese children". "Kara" (唐) is actually the character for the Tang dynasty (618-907) of China, considered by many as the golden age Chinese culture and power. The little children design on pottery symbolizes health for sons & daughters and longevity/continuity. The number of children on the design also have significance. You will probably see three, five or seven children. (Always odd, never even number!) The more children on the pottery, the higher is its grade. This matcha tea bowl has 5 children...and the pine tree is found on the inside of the bowl! All pottery pictured in this article are available for sale at the shop or by mail order. Fat Quarters ... So That's What They're Called! Added on May 24, 2012 by the ikebana shop. Seeing our selection of Japanese fabric, a customer, who turned out to be an avid quilter, exclaimed, "Oh, fat quarters!" ...which raised about 3 question marks on the top of my head. Fat quarters??? A standard roll of fabric is 44" wide. Fabric is normally purchased by the yard (36"). So a yard gives you a piece of cloth that's 44" x 36" big. If you want a regular quarter, then you'll get a cut that's 44" wide and only 9" long. Now, a "fat quarter" is when you cut the width in half and a yard-length in half as well...which gives you 22" x 18"...which is still a quarter of the basic yard, only "fatter". Apparently, quilters prefer fat quarters because they are able to cut bigger chunks of fabric for their purposes. Now, our Japanese fat quarters are a little chubbier, measuring around 22" x 20" ...which makes sense because 20" is about 50cm. And because Japan uses the metric system, these cuts are probably quarter meter (as opposed to yard)! Many patterns available at the shop. Added on April 19, 2012 by the ikebana shop. fter watching the movie Jiro Dreams of Sushi, we got to thinking how similar ikebana is to sushi. The film was subtitled in English but two important words were not translated but kept in the Japanese original: umami and shokunin. Umami has almost become a loanword (just like "sushi"!) incorporated in the English language. It normally refers to the "savoriness" of food. The different tastes and aromas of the ingredients are carefully combined then presented to provide a superb culinary experience. We learn the paradox: the simpler the food, the more difficult it is to prepare! What can be more simple, more minimalist than simply putting uncooked fish on rice? Yet we realize, it is not that easy. The fish needs to be sliced just so; the rice needs to be steamed with the correct pressure; the temperatures of rice and fish when the sushi is served should be just right, etc. Ikebana is also very simple...a few branches, a few flowers. Every one of them has its place in the arrangement. Nothing more, nothing less. We often use the analogy of a choir vs a duet. In a big singing group, if one person sings off-key, he can actually stay "hidden" and perhaps lip-sync. The performance is not affected all that much. In a duet, if one person sings out of tune, then the whole performance is ruined. In a huge bouquet of flowers, an errant bloom could be hiding somewhere in the back but still the arrangement would be OK. In ikebana, a single misplaced stem will be fatal. Jiro's style of sushi is similar...it is just sushi set on a plain black lacquer plate. No fancy decorations, no distractions...only umami. When we view a good ikebana arrangement, like putting one of Jiro's sushi in our mouths, we experience a kind of umami. Loosely translated, the word shokunin means "craftsman". But the film did not use the English word. To grasp the Japanese sense of the word, we must think of the craftsman of medieval times, when one traversed long years from apprentice to journeyman to finally, master craftsman. One's craft was one's life. A shokunin practices his craft, day in day out. Yet it is not a mere repetition of motions, not mass production. Be it a sheet of washi (Japanese paper), a samurai sword or a bamboo basket, every piece contains a part of theshokunin's spirit. Every time the shokunin creates something, he is always thinking of how he can make it better. He is forever perfecting his craft. So it is with Jiro. After more than 70 years of making sushi, he still thinks there is room for improvement. He was once told that sushi was a very old cuisine and whatever could be improved had already been done. He disagrees and continues to work on his "craft" and even dreams about it (thus, the title of the film!) There is no shortcut to becoming a shokunin. It is not a matter of taking the required courses and getting the diploma. The skill and instinct cannot be put down in a textbook. They are honed only by never-ending practice. In ikebana, you may be doing the basic variations over and over again. It could look like you are doing the same thing, but really each one is different. No two branches will ever be identical, just as no two seasons will be the same. Every arrangement is a new encounter, a new challenge. Anyone can follow the rules and arrange the branches in the proper lengths and angles...in the same way as anyone can cook rice and put a slice of fish on top...but the person with shokunin spirit sees beyond this. Always the question is how I can entice all the beauty out of what I have in front of me. The ikebana master will have conversations with the flowers. She gently coaxes the plants to show her their best faces, their preferred angles. This cannot be learned from reading the textbook...the only way is through practice, perseverance and proper guidance from someone who has been on the same journey. Jiro Dreams Of Sushi. Directed by David Gelb. Magnolia Pictures, 2011.